Dominic Gerard Francis Eagleton West (born 15 October 1969) is an English actor, musician and director. He is best known for portraying Detective Jimmy McNulty in the HBO drama series The Wire, and won the British Academy Television Award for Best Actor at the 2012 British Academy Television Awards for portraying serial killer Fred West in Appropriate Adult. He stars as Noah Solloway on the Showtime drama series, The Affair, for which he has received a Golden Globe nomination. West was born and brought up in Sheffield, West Riding of Yorkshire, the sixth of seven siblings (five girls and two boys) in a Roman Catholic family, largely of Irish descent. His mother, Pauline Mary "Moya" (née Cleary), was an actress, and his father, Thomas George Eagleton West, owned a plastics factory. West attended Eton College and Trinity College, Dublin. He graduated from the Guildhall School of Music and Drama in 1995. West's screen appearances include True Blue, Chicago, Richard III, and Mona Lisa Smile. His most notable television role has been as the American police detective Jimmy McNulty on the HBO television police drama The Wire. West was praised for the accuracy of his character's American accent. During his stint on The Wire, West directed the season 5 episode "Took". West starred as Lysander in the 1999 film version of William Shakespeare's A Midsummer Night's Dream. In feature films, he portrayed the heavy metal guitarist Kirk Cuddy in the 2001 film Rock Star. In 2006 West made a guest appearance as an actor in a sketch in The Catherine Tate Show, alongside "Frankie Howerd impressionist". In 2007, he played the Spartan politician Theron in 300 and a detective in Hannibal Rising. West played the supervillain, Jigsaw, in the 2008 film Marvel's Punisher: War Zone. In 2010 he had a role as General Virilus in Neil Marshall's adventure thriller Centurion. West stars in the UK ghost film, The Awakening. West has done other work on TV and radio. He appeared in the role of Oliver Cromwell in the Channel 4 series The Devil's Whore. He also performed as "Dr. West", the opening track on Eminem's 2009 album Relapse, as a doctor discharging Eminem from a rehab facility. West played the part over the phone in January 2009 while Eminem was recording it in a Miami studio. In December 2009, West starred as Hank in a radio adaptation of Eugene O'Neill's expressionist play The Hairy Ape for BBC Radio 3, was a guest presenter on the BBC show Have I Got News for You, and ended the year alongside Joan Rivers and Sarah Jessica Parker with an appearance on Graham Norton's New Year's Eve Show. In 2011, West appeared as a news presenter on the BBC-TV period drama series The Hour. He also played serial killer Fred West in the ITV two-part series Appropriate Adult, giving a performance that the serial killer's daughter described as capturing the "evil essence of [Fred West] - his character, his mannerisms, even his gait." In 2012, West was offered the role of Mance Rayder in the HBO fantasy series Game of Thrones, but turned it down due to the amount of time he would have to spend away from his family. He played gay activist Jonathan Blake in the 2014 film Pride about the 1984-1985 miners' strike in the UK. West stars as Noah Solloway on Showtime's series The Affair, which premiered October 2014. The series was renewed for a third season in 2015. As a theatre actor, West has played Edward in Harley Granville Barker's The Voysey Inheritance directed by Peter Gill at the Royal National Theatre in 2006. Around 2009, he starred at London's Donmar Warehouse as the protagonist in Helen Edmundson's adaptation of Pedro Calderon de la Barca's existential drama Life Is a Dream, for which he received glowing reviews. He took the title role in Simon Gray's classic comedy, Butley, playing at the Duchess Theatre in London from 1 June 2011. In the September he returned to his native Sheffield to play Iago to his former Wire co-star Clarke Peters's Othello at the Crucible Theatre. From mid December 2012 to January 2013, West starred as Henry Higgins in My Fair Lady at the Crucible Theatre in Sheffield. In 2015-16 he starred alongside Janet McTeer in Les Liaisons Dangereuses at the Donmar Warehouse in London. In 2009, West starred in a series of online films known as "The Carte Noire Readers". Made to promote French coffee brand Carte Noire, they consist of actors reading love scenes from a selection of sources. West reads extracts from Pride and Prejudice by Jane Austen; Lady Chatterley's Lover by D.H. Lawrence; High Fidelity by Nick Hornby; The Age of Innocence by Edith Wharton; Life Class by Pat Barker; The Moment You Were Gone by Nicci Gerrard; and Something Childish But Very Natural by Katherine Mansfield. In 1998, West and his then-girlfriend Polly Astor (the daughter of Michael Astor) had a daughter named Martha. West rekindled his romance with film producer Catherine Fitzgerald whom he had dated at university. The two married in Glin, County Limerick on 26 June 2010, and have three children. Fitzgerald is an Anglo-Irish aristocrat, the daughter of Desmond FitzGerald, 29th Knight of Glin, and was formerly married to Edward Lambton, 7th Earl of Durham. West is a supporter of care charity Helen's Trust in response to their assistance to his mother prior to her death. He led Team Canada/Australia for Walking With The Wounded, a fundraising event for wounded soldiers. He trekked to the South Pole against Team UK (led by Prince Harry) and Team America (led by Alexander Skarsgård). A few days into the trek, it was decided that the competition part of the race would be cancelled due to hazardous terrain and weather conditions, so the teams combined forces and continued. Alongside Harry, Skarsgård and several wounded soldiers, West successfully made it to the South Pole on 13 December 2013. In August 2014, West was one of 200 public figures who were signatories to a letter to The Guardian opposing Scottish independence in the run-up to September's referendum on that issue. In November 2010, West was awarded an honorary degree for services to the Arts by Sheffield Hallam University. In November 2011, he was awarded the Honorary Patronage of the Philosophical Society of Trinity College, Dublin, where he had earlier graduated with a degree in English. 2006 The Catherine Tate Show Actor Episode: "No. 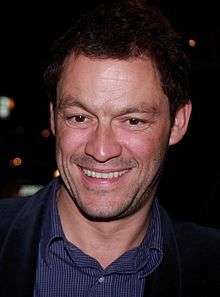 3.5"
↑ "Dominic West". Front Row Interviews. 3 July 2011. BBC Radio 4 Extra. Retrieved 18 January 2014. ↑ "Profile". directors.findthecompany.co.uk. Retrieved 19 April 2016. ↑ "Dominic West profile". TVGuide.com. Archived from the original on 29 May 2016. Retrieved 29 July 2016. ↑ "Television Awards Winners in 2012 - TV Awards". Bafta.org. Retrieved 26 August 2014. ↑ "Golden Globe actor profile". Hollywood Foreign Press Association. Retrieved 21 July 2016. ↑ Hardy, Rebecca. "My selfish womanising days are over ... thank god!' When he hit the big time with The Wire, Dominic West admits he was seduced by the trappings of fame". crookedtimber.org. Retrieved 11 July 2016. ↑ "WEST Moya: Death notice". irishtimes.com. ↑ Gliatto, Tom (5 August 2002). "Deceptive Detective". People Magazine. Retrieved 31 May 2011. 1 2 3 Anthony, Andrew (26 October 2008). "Andrew Anthony talks to actor Dominic West". London, UK: Guardian. Retrieved 10 March 2012. ↑ Philby, Charlotte (21 March 2009). "My Secret Life: Dominic West, actor, 39". London, UK: Independent.co.uk. Retrieved 26 August 2009. ↑ "Dominic West, Class of 1995". Guildhall School of Music and Drama. Retrieved 29 October 2014. ↑ Levinson, Paul; "McNulty on his fine Baltimore accent", PaulLevinson.blogspot.com; retrieved 26 August 2009. ↑ Rohrer, Finlo; Fraser, Katie (30 January 2009). "The good, the bad and the mangled". BBC News. Retrieved 10 March 2012. ↑ "'The Wire': The Dominic West perspective". Los Angeles Times. 17 February 2008. Retrieved 19 April 2016. ↑ "Official Domestic One-Sheet: Neil Marshall's Centurion". Dreadcentral.com. Retrieved 19 April 2016. ↑ "Early Sales Art: The Awakening". Dreadcentral.com. 14 May 2010. Retrieved 19 April 2016. ↑ "'The Wire' star Dominic West on Eminem's 'obsessive' love of the show". Entertainment Weekly. 28 May 2009. Retrieved 3 March 2012. over the phone from London in January while Em was in a Miami studio. ↑ "Drama on 3". BBC Radio 3. 2009. Retrieved 9 December 2009. ↑ "Jump for Latest Centurion Clip". Dreadcentral.com. 22 March 2010. Retrieved 19 April 2016. ↑ "TV portrayal of killer leaves daughter scared". Yahoo!. Retrieved 25 August 2011. ↑ Ryan, Maureen (3 August 2012). "'Game Of Thrones': Dominic West Of The 'Wire' Rejected A Role On The HBO Drama". Huffington Post. Retrieved 19 April 2016. ↑ "Dominic West on playing Edward Voysey - What's On Extras". National Theatre. Retrieved 19 April 2016. ↑ Spencer, Charles (14 October 2009). ""Telegraph Review of "Life is a Dream"". London, UK: Telegraph.co.uk. Retrieved 19 April 2016. ↑ Thorpe, Vanessa (20 February 2011). "Dominic West to revive classic stage role". London, UK: The Guardian. Retrieved 19 April 2016. ↑ Benedictus, Leo (22 September 2011). "What to say about ... Othello with Dominic West and Clarke Peters". London: the Guardian. Retrieved 19 April 2016. ↑ BWW News Desk. "Crucible's MY FAIR LADY, Starring Dominic West and Carly Bawden, Aiming for West End, May 2013?". BroadwayWorld.com. Retrieved 19 April 2016. ↑ "Andrew Anthony talks to actor Dominic West". London: GMG. 26 October 2008. ISSN 0261-3077. OCLC 60623878. Retrieved 29 January 2012. ↑ "Wire actor West marries long-term Irish partner". Irish Examiner. 28 June 2010. Archived from the original on 11 January 2016. Retrieved 10 March 2012. ↑ Clark, Sarah (1 April 2012). "Superstar actor back in Sheffield for role that's close to his heart". ITV. Retrieved 29 May 2014. ↑ "Prince Harry completes South Pole charity trek". Daily News. New York. 15 December 2013. Retrieved 15 December 2013. ↑ "Celebrities' open letter to Scotland – full text and list of signatories". theguardian.com. 7 August 2014. Retrieved 26 August 2014. ↑ "The Wire star Dominic West to receive honorary degree". BBC News. London, UK. 4 October 2010. ↑ O'Connell, Edel (23 November 2011). "Wire' star pays tributes to wife as he visits alma mater". Irish Independent. Dublin. Wikimedia Commons has media related to Dominic West.